You are currently browsing the Graeme J W Smith blog archives for September, 2011. Joe Caruso continues to inspire…..
Joe Caruso, center, is flanked by teammates Kathy Lewis and Mitch Turner on Saturday after the trio completed the Amica 19.7 Newport sprint triathlon. Caruso, who was first diagnosed with cancer in 2009, completed the 16.1-mile bike portion. For those of you who read my first blog about why I was learning to fly - one reason that spurred me on was news of friends and collegues who were facing living with cancer. When I wrote that original post – I left out the names. Later one of my friends agreed that I could name her and if you have followed the progress of learning to fly – you will see who she is. MIDDLETOWN, R.I. – Joe Caruso is certain that being active is keeping him alive. Diagnosed with Stage IV adenocarcinoma, or nonsmokers’ lung cancer, in December 2009, the Newport resident scoffed at the idea of remaining stagnant during his chemotherapy and radiation treatment. He competed in the Save The Bay Swim a few months after being diagnosed and remained a fixture on the local triathlon scene. A father of three young boys, Caruso wasn’t going to let cancer beat him. But not long after he competed in the Mooseman triathlon in Newfound Lake, N.H., in June, things took a turn for the worse. He felt a bit dizzy and went to the doctor for an MRI. He was told the cancer had spread to his brain, and the next week, he started three straight weeks of full brain radiation. 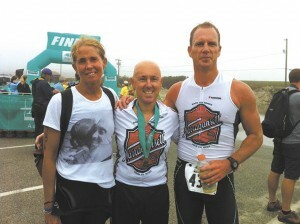 “The doctors told me I was going to be tired, but I had just completed an Olympic distance marathon,” said Caruso, 44. “I was going into this feeling healthy, and I figured I would be back on my feet in a week. Everyone can relate to cancer, but I can relate to what Caruso is going through. My mother, who was diagnosed with Stage IV lung cancer in September 2009, also had the disease spread to her brain. She passed away earlier this month. Throughout all of the radiation and chemotherapy treatments, she was tired. Getting out of bed was a chore, and ascending a flight of stairs was torture. Nobody would have blamed Caruso if he never competed in another triathlon, but that’s simply not his style. He ended his brain radiation treatment on July 6 and picked up where he left off with his training. Last Saturday, he teamed with Mitch Turner of Middletown and Kathy Lewis of Newport to tackle the Amica 19.7 Newport, as part of Team Caruso. Lewis took the half-mile swim, Turner ran the 3.1 miles and Caruso biked 16.1 miles, which he said felt more like 100. Team Caruso finished last of the eight teams – “It was tough getting passed by the ladies and the older men,” Caruso said jokingly – but winning was never the goal. “I feel that exercise is definitely keeping me alive,” Caruso said. “When I’m out there breathing hard, I try to inhale clean air and exhale those cancer cells. So that’s why exercise pays off. That’s what I tell myself. Caruso also wants to set an example for his sons – Mason, 6, Tyler, 4 and Noah, 3. “I want to show them that you can never give up, and that anything is possible,” he said. “I want to let them know that there are always struggles in life, and you have to try your hardest to overcome them. And Caruso will continue to inspire and motivate until he’s no longer physically able. He’ll take part in the Jamestown Classic, a 19-mile bike race, in October, and the Newport Pell Bridge Run in November. Then he’ll spend the winter in the pool in preparation for the Save The Bay Swim. To help support Caruso, his wife Linda and their three boys, visit www.JoeCarusoFamilyFund.com.